My mother, brothers and I used to get Downfield tram which stopped outside our closie in Dens Road to go to the berries at Downfield or go to the Sidlaws on a Sunday for a picnic. We had to walk from the terminus but we used to enjoy all this when we were young. I lived in Clement Park and went to Harris Academy on our special tram. On the Friday before the 'last tram', we decorated our tram with homemade banners, balloons and streamers. We sang all the way into town and out again, and had a whip round for our driver and conductor. The buses were never the same. I do recall that there were quite a few days afterwards, both that winter and the two or three after, when snow, hard frost or freezing fog stopped the buses, certainly on one Christmas Eve, either 1957 or 1958, there was chaos. 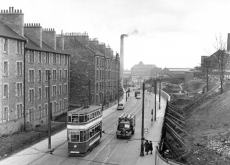 The universal cry was "Nivir happened when wi hid the tramcars - they aye got through" And they did too!